into a lot more of this! With the proposed footbridge going into Terwillegar park we will lose more trails in the river valley. Once a place I proudly rode, I now visit sparingly thanks to the same development threatening more trails. If this happens this will most likely kill the desire for a lot of you who ride there frequently. This cannot happen! This is still a pretty solid place to go for a ride in the Edmonton area. You saw those red stakes this Summer, that spells doom for those incredible trails. The release I believe from Edmonton Mountain Bike Alliance below. Phone and complain to the person in charge of this, send emails, form an angry mob carrying torches. They cannot do this to us! Edmonton City Council has recently approved the construction of a new Footbridge, connecting Terwillegar Park with the North Bank of the North Saskatchewan River. The approval of the new Footbridge has also lead to the approval of roughly 5 km of 3 metre wide paved and/or granular pathways on top of some of Edmonton’s oldest and most cherished singletrack. - Proposed “South Trail” (otherwise known as the “Golf Course Trail” singletrack) will see current singletrack replaced with a 3 metre wide granular pathway. See page 4 of the Terwillegar Park Footbridge/West End Trails Feedback pdf. - Proposed “North Trail” will see current singletrack replaced with a 3 metre wide paved pathway. See page 3 of Terwillegar Park Footbridge/West End Trails Feedback pdf. - The full Terwillegar Footbridge/West End Trails redevelopment plan can be found online here. The City of Edmonton is currently reviewing each of the potential options, and now is the time for cycling enthusiasts to have their voices heard. The singletrack currently in place at each of these identified locations has been built through years of hard work and dedication of local volunteers, and would be a great loss to the local cycling community. 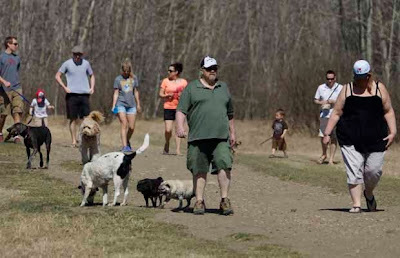 If you have an issues or concerns with any of the proposals presented in the Terwillegar Park Footbridge/West End Trails redevelopment, please contact Rob Marchak at rob.marchak@edmonton.ca (you can also call him at 780-442-1377) or your local city councillor atcouncillors@edmonton.ca. Have your say!